GuideToLenders is one of the options for those people looking for additional money without asking for help their friends or relatives. Before you accept offers found through this company, it is important to find out if it is a service provider that will not cost you too much and if it is a reliable company that you can trust to. 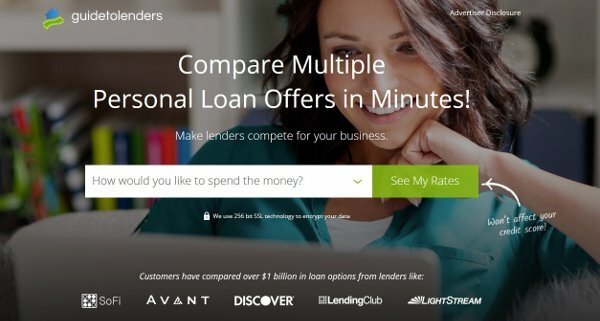 GuideToLenders is a loan service that cooperates with a number of lenders, allowing their customers to enjoy finding the best deal to obtain personal loans. The service is suitable for people with different credit scores. It has been working since 2005, and they have served thousands of customers. The service does not give personal loans, but it helps to find a lender offering the best conditions. An option to find the best rates. The company rating on the official website of the BBB is F, which is the lowest. One of the factors contributing to such as low rating is two negative reviews published on the website in the spring of 2018 that were never replied. According to one review, the serving was annoying sending the messages to a person who was not their customers. The other review is complaining about the service that never contacted him back. The company’s rating at ConsumersAdvocate.org is 9.2 out of 10, although there is information how many customers voted. The company’s rating at highya.com is 1 out of 5 based on votes by 3 customers. Its rating on TrustScore is 6.4 out of 10. It is a very convenient service that allows finding the best conditions and it that can be used even by people with poor credit scores. They allow getting loans in different amounts and for different periods of time. The company charges a pretty reasonable APR. However, they have received different ratings from very low to excellent. That ші why you may consider using the service of GuideToLenders.com, but it is important to ensure that their customer support team is responsive.